Diagnosis: The Eastern Woodrat is a pack rat characterized by large, rounded, and sparsely haired ears, large black eyes, and soft fur. Coloration is brown and black on top in varying intensities and white on the bottom. Males are slightly larger than females. Specimen weights from a Kansas study recorded an average male at 299 grams and an average female at 197 grams. They possess 4 toes on the front feet and 5 on the back feet with well developed claws. Natural History: This species breeds from February to early September. Litters of 2-3 are most common but up to 6 babies have been recorded. Gestation periods run from 31-36 days, time of weaning is 3-4 weeks, and time to independence is 70-90 days. Females can reach sexual maturity in 5-6 months and males in 1 year. 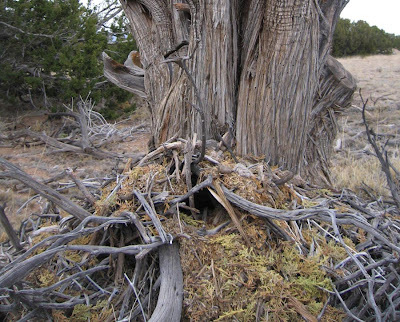 They are known for building large dens, or “middens”, out of sticks. They use these middens to store fruits, seeds, and leaves to eat during the winter. Distribution: Can be found in deciduous forests, grasslands, and riparian woodland, from southern South Dakota, south to eastern Texas, east through central Florida, north to the western and Piedmont areas of Maryland, and west following the Appalachian Mountains toward southwestern Nebraska. Some individuals have been found as far east as coastal North Carolina and as far west as Colorado. Habitat: This species inhabits a wide variety of habitats including heavily forested areas, swampy areas, caves, outcrops, rocky hillsides, grasslands, intermittent stream beds, and small portions of desert where their middens are constructed around cactus. In Kansas, the Eastern Woodrat typically has two major types of habitat. They are common in hedge-row habitats of osage orange trees, Maclura pomifera, and rocky outcrops. Diet: Eastern Woodrats have great adaptability in their feeding habits. They feed on almost any kind of plant material including berries and fruit, nuts, leaves, twigs, and bark. Rainey, D.G. 1956. Eastern woodrat, Neotoma floridana: life history and ecology. University of Kansas Publications, Museum of Natural History 8(10): 535-646. Wiley, R.W. 1980. Neotoma floridana. Mammalian Species. 139:1-7.